For more kayaking, mountain biking, surfing or windkarting options contact Harris Outdoor on Leverburgh Pier on 07788 425157, or their counterparts in Lewis – Adventure Hebrides – on 07920 427194. There are several remote islands around the shores of the Western Isles, which are now all nature reserves. A number of boats run tours to them, which are great for spotting wildlife – seals, dolphins, golden eagles and puffins among them. The most famous is eerie St Kilda, or Hiort in Gaelic,, a World Heritage site for both its natural and cultural heritage site which lies 40 miles west of Harris and was abandoned by its human inhabitants in 1930, but remains home to a large gannet population. It has the highest cliffs in the UK at 427m. A couple of the operators include: www.seaharris.co.uk (01859 502007) or www.kildacruises.co.uk (01859 502060). 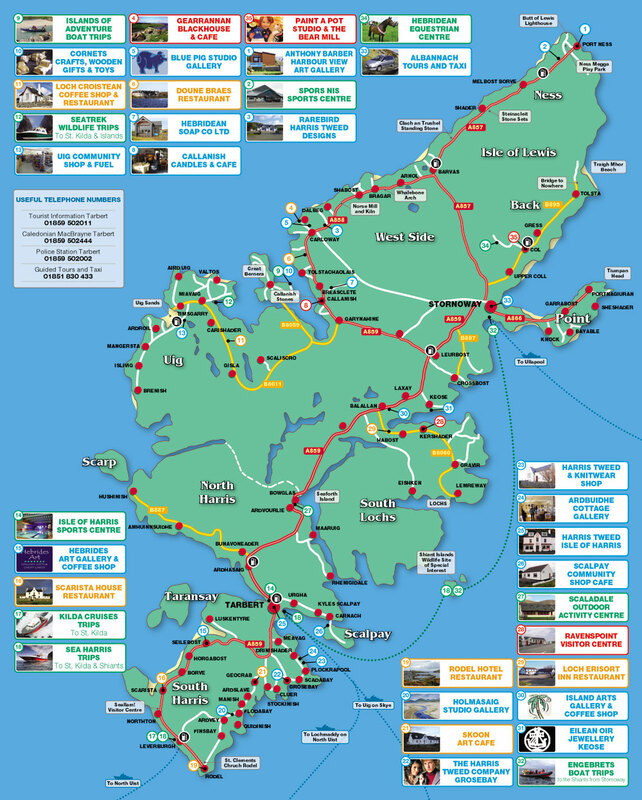 If you are looking for something less adventurous, a trip over to Taransay, Scarp, or a trip around the cliffs of South Harris make a pleasant day out, don’t involve the distance or the swells of St Kilda and are likely to involve some interesting wildlife. For experienced walkers, the Western Isles have no Munros (peaks over 3,000 ft), unlike Skye. The main attraction is its only Corbett (peaks from 2,500-3,000 ft) – An Cliseam. Although it might be outside the premiership in terms of height, it shouldn’t be underestimated – take advice and go fully prepared. There are two routes up from the A859, north of Tarbert. In South Harris, if you drive through the village of Northton and park at the far end, there is a great walk that leads out through the Machair to a ruined medieval chapel on the coast. The mighty outline of the mountain of Ceapabhal, which dominates South Harris, looks down on you the whole way. If you’re lucky, you’ll spot a golden eagle gliding near the top. If you extend the walk up to the mountain’s summit, you’ll be rewarded with amazing views out to St Kilda and the Atlantic beyond. Take the old track from Tarbert to Rhenigidale, which, until 1990 and the arrival of the road, was used daily to deliver the mail. Park in the lay-by in Urgha, and it’s about 7 miles over the hills, passing through a luscious fern oasis (honest! ), along the way. If you book in advance, the bus will bring you back to Tarbert from Rhenigidale. Take the bridge onto Scalpay and visit Eilean Glas Lighthouse – one of Scotland’s oldest lighthouses completed in 1789, and now in urgent need of renovation. Drive through the village as far as you can, until you reach the beginning of a well marked walk that takes you over the moor to the lighthouse. It’s about a 4 mile round trip. Cross the Island from Seilebost to Stockinish on the East Coast, and see the changing scenery from sandy west coast, to heather moor and mountain to rocky east coast. This path follows the traditional “coffin track” which islanders on the east coast took to bury their dead in the sandy western soils. The path is signposted from the road. There are many great walks which highlight the majestic scenery of North Harris. One of the more accessible options is to take the hydro-electric track (about 1km before Amhuinssuidhe Castle) north off the Huishinish road. Park the car whenever you reach a locked gate or the terrain becomes too rough and continuing on foot. The track climbs into the mountains, skirts a number of lochs and ends with a spectacular panorama and overhang over Lewis. There is a sports centre attached to the school in Tarbert, with a pool, small gym and spin bikes. The hours are a bit erratic, particularly in school time so ring them to check (01859 502944). There is a larger Sports Centre in Stornoway, near the Council offices, again with a pool.